Waves of post-secondary institutions, student, business, and community leaders, media personalities, politicians, and every day Albertans have participated in this campaign that supports survivors with a powerful message of support. Despite the positive trends in Alberta, the national reporting rate for sexual assault remains at five per cent. So, while we’ve made great gains, but we still have a distance to go. This year, the goal is to encourage Albertans to join the conversation in support of sexual assault survivors. In the last year, we have seen a sea change in responder attitudes toward sexual assault survivors. #Metoo has swept across the world, and is impacting not just Hollywood, but business and political centres of influence. This tremendous cultural shift is both celebrated – and questioned. 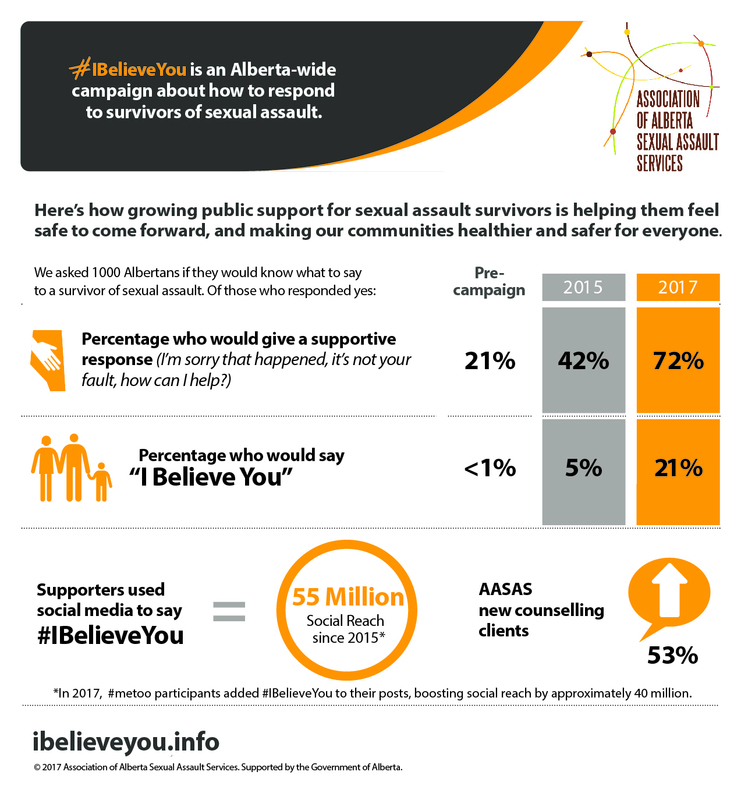 That’s why we are engaging Albertans in conversation around #IBelieveYou …Now What? We will be posting videos from our organization, sexual assault centres across the province and Alberta post secondary institutions. Together, we can make an even bigger impact on the lives of survivors, and make our communities healthier and safer for everyone.